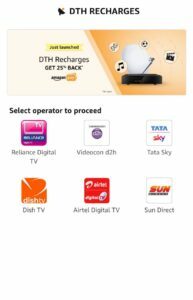 This Amazon DTH Recharge Offers || Amazon is here with a great offer presenting upto 25% cashback DTH Recharges . DishTV and Videocon D2H Users can avail cashback of 25% on their transaction . Rest of DTH users get flat 20% cashback on the transaction .Grab the offer Now.!! How to get Amazon DTH Offer ? 4. Select your DTH Operator and fill the details on next page. 5. Complete the payment via any Online Payment method. 6. That’s it. Your DTH will be recharged soon. You’ll get your cashback in your Amazon Pay Wallet. This Offer applicable for recharges for Rs.200 or more.